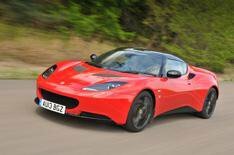 2013 Lotus Evora S Sports Racer review | What Car? Despite its name, the Lotus Evora Sports Racer is no more track-focused than other Evoras. Instead, it gives you a lot more standard kit for not much more money. On the outside, premium paint (in red, white, blue or grey) is combined with a black colour scheme for the roof, sills, rear diffuser and wheels. Meanwhile, inside you get extra leather trim, the optional +2 rear seats and black or red Premium Sport front seats with contrasting piping and stitching. Lotus's Tech Pack is also included, bringing upgraded speakers, Bluetooth, a USB socket, cruise control, parking sensors and a touch-screen sat-nav system. What's more, Lotus fits the Sports Pack from the Evora S, which includes a sports exhaust and a sport button that sharpens the throttle responses, increases the rev limit and relaxes the stability control system. The Sports Racer package is available on both the standard V6 Evora and the supercharged S model. We tried the latter. What's the 2013 Lotus Evora Sports Racer like to drive? There are no mechanical changes, so this is where the Evora excels. It feels light and agile, changing direction with seemingly no inertia, while the steering provides loads of feedback and the ride is surprisingly comfortable. True, plenty of rivals offer more front-end grip, and the Evora can follow imperfections in the road surface, but it's still a joy to drive on challenging roads. The supercharged engine in the S model adds to the thrills, because it builds speed swiftly and progressively and sounds good when you work it hard. However, it's disappointingly rattly at lower speeds. The stiff and notchy manual gearbox will also get on your nerves, and there's a lot of road noise on the motorway. What's the 2013 Lotus Evora Sports Racer like inside? The Premium Sport front seats are fantastically supportive, while the cabin is trimmed in appealing materials. However, there are some cheap-looking details, such as the ancient steering column stalks and the fiddly aftermarket infotainment system. Like all Evoras, the Sports Racer has wide sills, heavily offset pedals and huge rear blind spots (although the standard rear-view camera helps a little when you're reversing), and much of its switchgear is hidden from view. The two rear seats are strictly for emergencies, although they can be used to hold any luggage that won't fit in the tiny boot. If you're going to buy an Evora, the Sports Racer package is worth specifying because it adds just 3450 to the price of a +2 model, despite bringing around 10,000 worth of desirable options. The trouble is, the Evora costs thousands more than a similarly equipped Porsche Cayman S, even though the Porsche is at least as good to drive and much easier to live with.